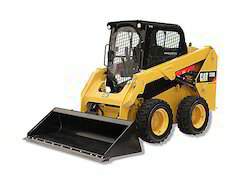 Cat® Skid Steer Loaders are designed and built for maximum performance and safety. We are constantly developing and refining advanced power and hydraulic technologies to ensure that our Skid Steer Loaders provide customers with the power, versatility, efficiency, ease of operation and reliability they have come to expect from Cat Equipment. The Cat Skid Steer Loader, with many work tool options, is ideal for construction, landscaping, agriculture and other applications. It delivers traditional Cat reliability and durability with excellent productivity.